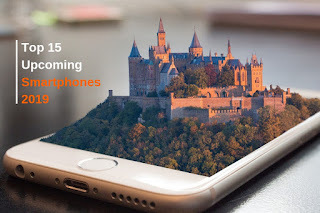 There are lots of latest smartphones available in the market, but in order to select one which can complete your need, we have prepared a complete guide on top 15 upcoming smartphones 2019 to help you select the best from the rest. The Vivo will launch its latest smartphone on 20 February 2019. Vivo APEX 2019 will be this year`s most attractive smartphone. The concept of this smartphone is to use touch-sensitive buttons rather than physical buttons. The smartphone comes with a complete unibody seamless design without having any physical buttons, speaker grills or any port. The full display acts as a fingerprint sensor, that means you can unlock your device by placing your finger anywhere on your screen. There are no speaker grills, the screen itself acts as a speaker and Vivo APEX 2019 supports wireless charging. APEX 2019 features Snapdragon 855 Soc, under-display fingerprint scanner, unibody curved glass. Samsung will unveil its flagship smartphone on 20 February in San Francisco. The Galaxy S10 could be sized at 5.8", 6.1" and 6.4". Galaxy S10 will come in both 4G and 5G variants. It will come with AI-powered Exynos 9820 Soc and 5G variant will use Snapdragon 855 Soc. Read our complete guide on the Samsung Galaxy S10. Chinese smartphone maker "OnePlus" will launch its flagship device this spring. The OnePlus 7 will feature a 6.4" QHD display with a punch hole design, under display fingerprint scanner, glass back. This will be a water-resistant smartphone with an IP68 rating. As this is a flagship device, It will support wireless charging and will have 10GB of RAM. Google is working on a lower specification version of the Pixel 3 XL. The Pixel 3 XL lite will be the latest smartphone in the Pixel series and will be priced lower than its predecessors. The Pixel 3 XL lite will feature 4GB/64GB, Snapdragon 710 processor, 6" FHD display, Android Pie. LG will unveil its new high-end smartphone from the V series on 24 February at MWC Barcelona. The LG V50 Thinq will be a 5G enabled smartphone and will be powered by a Snapdragon 855 Soc. The V50 features a 6" display, 4000 mAh battery, wireless charging, type-c port. LG has introduced a vapor chamber cooling system for more efficient heat management. Oppo is going to launch its new budget smartphone with an in-display fingerprint scanner. Oppo K1 is currently listed on Flipkart and it will be revealed on 6th February. This will come with a 6.4" display with water drop notch. Motorola will introduce 4 models (G7, G7 Play, G7 Power, G7 Plus) in its G7 lineup during an event on 7th February in Brazil. Moto G7 will feature 6.4" display (1080x2270), Gorilla Glass 5, Snapdragon 632 Soc, 4GB/64GB. The Moto G7 will also have a Type-C USB and 15W fast charging. Nokia will launch its worlds first Penta camera smartphone at MWC on 24 February. Nokia 9 PureView will have a 6-inch display with HMD`s pure display screen technology. But the main attraction in this smartphone will be its 5-rear cameras and glass back. According to reports, Nokia 9 PureView will have the ability to take 5 simultaneous shots and allowing up to 10x more light, suggesting better low-light photography. This will feature an under display fingerprint scanner, 18W fast charging, Snapdragon 845 Soc, 6/128GB or 8GB/256GB memory configuration. Vivo has launched has a teaser confirming the date of its Vivo V15/V15 Pro launch. Vivo will launch V15/V15 Pro on 20 February in India. V15 Pro is a pop-up selfie camera smartphone with 32MP selfie camera. Vivo V15 Pro will feature 6.6" display (1080x2316), Android Pie, 2.8GHz octa-core Soc, 6GB/64GB, 4100 mAh battery, under display fingerprint scanner. Redmi Note 7 Pro will be a 48MP smartphone with Sony IMX 586 sensor. Redmi Note 7 will feature a 4000 mAh battery with quick charge 4 support, Snapdragon 675 Soc, 6GB/128GB, 6.4" FHD display, Corning Gorilla glass 5. Samsung recently unveiled their latest mid-range smartphone "M10 and M20", the third much-anticipated smartphone in this series will also release soon. Samsung Galaxy M30 will have a 6.38-inch (2280x1080) FHD display with a water drop notch. M30 will feature Android 9.0, 16MP front camera, 5000 mAh battery, type c connector, Exynos 7 Soc, triple rear camera. LG will launch G8 ThinQ and 5G variant of V50 ThinQ at MWC 2019. G8 ThinQ is rumored to come with a 3400 mAh battery and 6.3" OLED display (1440x3120). G8 ThinQ will feature Snapdragon 845 Soc, Android 9.0, 6GB of RAM and 64GB ROM expandable to 2TB. On the back, there will be a dual camera setup of 16+20MP. The Huawei P30 lite will feature a 6" FHD display with a screen resolution of 1080x2340 pixels and runs on Android Pie. The P30 is powered by HiSilicon Kirin 710 Soc and has a 3400 mAh battery in its hood. It will feature a triple rear-camera setup (20+16+2MP), 6GB/64GB, under-display fingerprint scanner, water-resistant body, Face recognition, Unibody design. Xiaomi will launch Mi Max 4 Pro in the middle of this year. Mi Max 4 Pro will feature a massive 7.2" (1080x2340) FHD display, Snapdragon 675 Soc, Gorilla Glass 5 protection, 5800 mAh battery, under display fingerprint scanner, type-C connector. Xiaomi has managed to keep a 3.5mm headphone jack in Mi Max 4 Pro. The main highlight of this device will be its dual rear camera setup of 48+20MP. Huawei Mate Flex is a foldable smartphone with 5G support aimed to launch at MWC on 24 February 2019. Huawei`s mobile division tweeted about an event called Connecting The Future, taking place on 24 Feb. Huawei CEO Richard Yu confirmed the launch of their 5G Smartphone. "We will launch the world's first 5G smartphone with a foldable screen at MWC Barcelona," he said at a meeting in Beijing. We hope our complete guide on the top 15 upcoming smartphones 2019 helped your select your latest smartphone.